Afan again. The all-new Whyte’s Level, complete with an ace new black run (the raggedy steep bit at the end with fridge-sized rocks to launch off is particularly fine), the new “Energy” singletrack, which packs in a long line of tabletops (mostly bottled) and Endor-style high speed twisty singletrack, and the same old fantastic never-ending final descent, now with a little bit of twisty boardwalk thrown in for laughs. And the sun shone all day. What more could you want? The after-effects of another great ride on the 5. Roych Clough, up Coldwell Clough, down Jacob’s ladder and up Chapel Gate. The trails were nicely dry, the scenery was great (predictably, since my camera batteries were flat), and the bike behaved itself impeccably; Jacob’s ladder was descended without even a pause at the top, and I almost cleaned the climb up to Edale Cross (though I did manage to fall off sideways whilst trying to climb up Chapel Gate). And I was back in time for tea. I don’t very often get the chance to spend a whole weekend riding my bike these days. However, the promise of a new bike, plus the child-guarding capabilities of a sudden influx of in-laws, meant that for once the option of getting out for both days was available. Of course, the natural balance of the universe meant that such a fine opportunity had to be balanced, in this case with the worst weather since about mid febuary. Still, not to worry; it’s only weather. On saturday, I headed down to Crickhowell, in south-ish wales, to do the “classic” Pen Trumau / Mynydd Du loop. “Classic” in this context means that there will be massive hills (mostly upwards), mud, and unrideable climbs. A perfect test for my new 5 :-). The long climb up from Llanbedr to Pen Trumau was a real test of stamina, but super-scenic, with a proper big-mountain feel. From the col, a rocky blast back down again was made slightly more taxing by horizontal rain. Another short sharp climb up to Castel Dinas was rewarded with a fun sunken lane (sunken in this case under about a foot of water). Then the day’s biggest climb, up the side of Y Das. The route guide suggested that all but the last 200 yards of this should be rideable; perhaps this was true in 1985 but now it’s been badly torn up by motorbikes, and required almost a kilometer of tedious pushing/carrying. However, from the top, there’s almost 10K of non-stop descending; first over a faint moorland trail, which gradually turns into a rough land-rover track past Grwyne Fawr reservoir, then an old drove road which provides a fast descent back to the road at the edge of the Mynydd Du forest. Climbing back through the forest was almost my undoing; after half an hour’s solid climbing I somehow lost the track and ended up pushing up a fire-track through ankle-deep mud. Just when I was about to give up and turn round, though, I spotted the forest edge through the trees. A few more minutes of carrying, and an emergency flapjack to recharge, and I was bouncing along the moorland over Crug Mawr. A steep descent back down took me back to Llanbedr, completing a round with about 40K of distance and lord knows how much climbing. 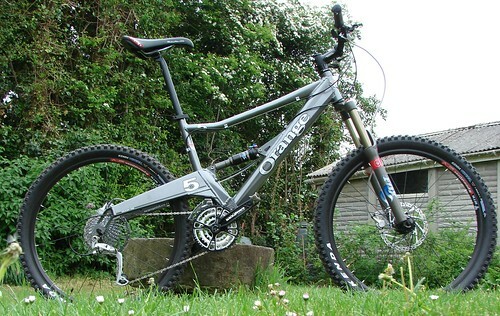 The new bike has certainly proved that it can handle the old hardtail’s workload. Sunday’s original plan was to head to Afan Argoed, just north of Swansea. However, a terrible weather forecast required a re-think; 7 hours driving just to ride in the rain for 2 hours didn’t really seem worthwhile. So instead we headed to Llandegla, which is only a couple of hours from Coventry. Steve has a fuller trip report. Despite one or two slightly hairy moments – a couple of sideways slides on the wet surface, and a rather too exciting nose-first landing on a tabletop – it went very well; the rain almost held off, and the new bike soaked up all of the abuse that I dished out to it. Seems like it’s filling the old full-suspension bike’s shoes (or should that be tyres?) too. update I’ve just got back from spending a day ragging it round Coed-y-Brenin, and can confirm that it’s ace. Pin-sharp handling, light enough to get airborne off the smallest of bumps, but with enough travel to get you out of trouble when it leads you on a bit too far. Doesn’t quite have the Coiler’s ‘unstoppable force’ feel through rock gardens and the like, but it’s got just the right combination of being light enough that you can point it where you want to go, and stiff enough that it will actually go there. The light front end (the forks and front wheel together weigh about half of what the coiler’s do) make it much easier to loft the front off drops and land on both wheels, rather than just diving down into them and hanging on the back. The forks and shock both need a bit of tweaking (I’m only getting about 120mm off the front, but blowing though all the travel on the back), but 10 minutes with the shock-pump should sort that out. Still loving my shonky one-speed bike . I took it round Coed Llandegla yesterday, and it was an absolute hoot. There was only one section where the lack of any gears was problematic – a ten-yard section of slippery uphill boardwalk, where I couldn’t get the power down gently enough to stop the back wheel spinning out. Other than that, though, it was great, and the combination of light weight and a small, flickable frame is perfectly suited to floating over the tabletops (and crashing through the doubles). 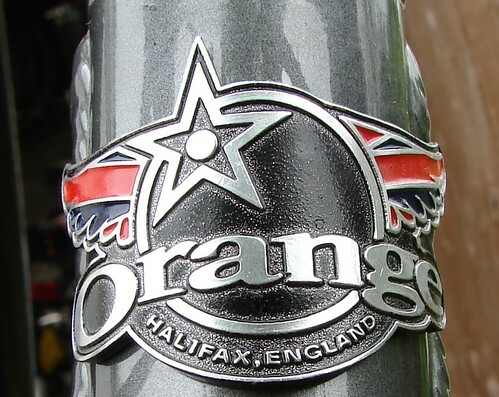 The freehub is starting to make some rather nasty graunchy noises – think it might be time for a replacement soon. I’m in the process of getting rid of my Coiler , as it’s just too much bike for me – despite being fantastic fun to ride, I’m really not using it to it’s potential, so it’s going to a more deserving home. I’m also wondering how best to get rid of my geared hardtail, since I almost never ride it now. I think i’ll probably split it and ebay the components that are worth anything. I’ve ordered a lighter FS (of which more news when it arrives) that will replace replace both the coiler and the geared HT, but sometimes when I get back from riding the on-one I wonder whether I should really bother with another bike. The idea that I could ride singlespeed all the time seems a bit absurd, but it does seem to be the case that for all but the longest of days out, it’s really not that much of a disadvantage. I took the day off yesterday, and headed for Coed-y-Brenin for a day’s mountain biking. I visited CyB last summer , when we did all the trails in one very long day, but this time round we weren’t intending anything quite so strenuous. CyB has had a fairly substantial makeover over the winter, with a spangly new visitors centre, a re-configuration of the trails, and a few Ks of new singletrack. There’s more in the works, too; as we went round we could see where the new lines were going to be, so it’ll be worth revisiting next spring. As we drove over, the weather was grim, with thick fog and light drizzle, but once within about 20 miles of the coast it suddenly cleared, and we had blue skies and warm sunshine all day. We set off to do the ‘Dragons Back’ – a 30K route that takes more-or-less the same route as the Karrimor used to on the east side of the valley, but missing out the stuff on the west, and with some new singletrack to start with. It started with a KM or so of fairly technical amoured trail, presumably put there as a ‘granny-stopper’. Stu, who’s riding has thus far been restricted to Cannock plus one short trip in the Peaks, found it tricky, and was over the handlebars after a couple of hundred meteres. However, he got the hang of it pretty quickly (there’s really only 2 things to remember: arse off the saddle and over the back wheel to keep your weight back, and don’t touch the front brake when you’re on wet rock). We carried on round, taking in more nice singletrack, followed by an interminable climb up over the back of the valley (we stopped for a breather, and were circled overhead by a pair of buzzards and a raven, presumably waiting for us to expire). Then the ‘Adams family’ descents – this time a bit sketchy on the wet rocks at the top, but still bags of fun, especially on the rollers lower down. Then the annoyingly loose and tiring climb back up for the ‘pink heifer’ descent – again good fun, but getting a bit erroded. There’s a new line being dug parallel to the old descent which looks like it will be a classic when completed. At this point, Stu’s legs decided they had had enough, so he took the fire-roads back to the visitor centre, whilst I went for one last climb, then the ‘beginning of the end’ descent back down, which I think has been re-armoured recently as it’s become very rocky. I was glad to be riding the coiler, with stacks of suspension travel to compensate for my mistakes, rather than the more unforgiving hardtail. I attempted to take a few photos on the way round. As per usual, the action shots were rubbish – there’s just not enough light in the woods for my feeble little camera to get a fast enough shutter speed, and I never want to stop on the good bits to take pictures. But some of the scenery came out quite nicely. I love my Inbred . I’ve been riding it almost exclusively over the summer, mostly at Cannock, but also for pootling round town, trips out with the kiddie-seat / tag-along, and even the odd commute in and out of work. 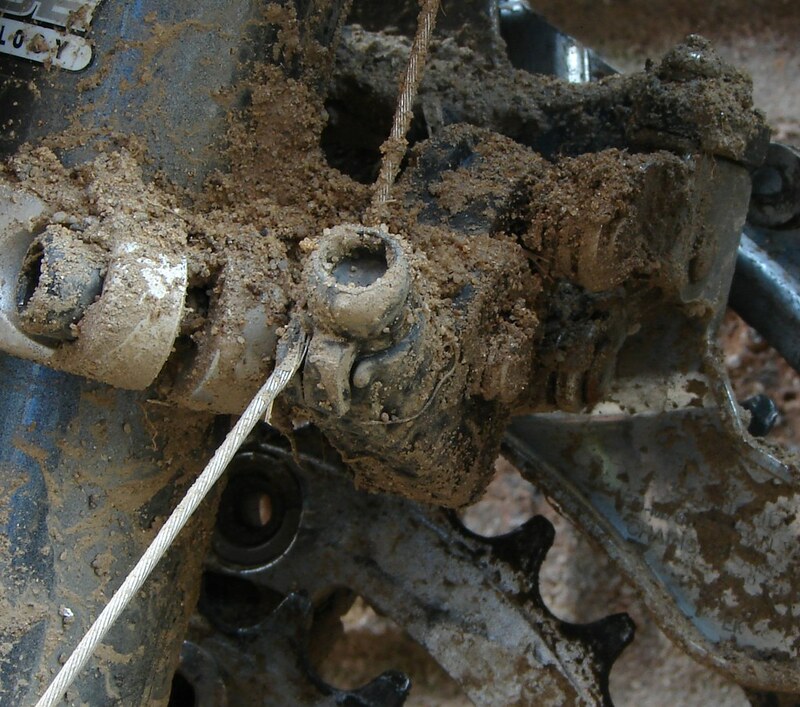 One of the best things about it is that you pretty much never have to clean it – no derailleur means no need to worry about the state of the chain. So it seemed like an interesting possibility for a winter bike. However, the rigid forks, whilst great fun through the woods, are too unforgiving for me when I’m out over rocky terrain. I ended up creeping down stuff at 2 mph, waiting for the front end to hook up and throw me over the handlebars. So, ebay furnished me with a nearly-new pair of MX Comps; forks whose primary claim to fame is not so much the plush suspension action as their complete imperviousness to mud and grime. A perfect match for the singlespeed, then. We rode a loop from Wildboarclough, out to Macclesfield Forest, down through the forest to the dam, up from the Leather’s Smithy pub to Charity Lane, down Charity Lane to Forest Gate, up to the Cat and Fiddle, over the moors to Three Shires Heads, up to Turn Edge, on to the Llama Farm at Flash, down into Gradbach, over Burntcliff Top and then down the road to ford Clough Brook, then back to the car. About 20 miles, and a metric shed-load of climbing. There were only 3 sections where I got off and pushed; The last 50 yards on the road up to Charity Lane, the steep drive up from the Llama farm, plus a couple of dabs on the climb up from 3 shires head (which I don’t think I’ve ever cleaned on a hardtail, though I have on the Coiler). The two road climbs I could have got up, I think, but I was a bit worried about pulling a muscle. The big climb up to the Cat & Fiddle was no problem at all :-). So in other words, whilst it was a bit more effort than the geared hardtail, it was no less effective. And the only time I wished for a higher gear was on the road descent back to Clough Brook, where to be honest I was quite happy just freewheeling at 30 MPH. The lighter back-end of the singlespeed seems to make it easier to flick about on the loose, rocky climbs, too, which is a definite bonus. This could, of course, just be down to the Genius Frame Designer – on-ones, and inbreds in particular, have a reputation for handling much better than their price-points would suggest, and this one certainly fits into that category. It just seem to go where you tell it to, whether on the climbs or the descents. Very pleasing. Not much of a tradition, I grant you; but I did the same thing last year, so it’s a start: Patrick and I headed over to Church Stretton for another after-work bike ride (after-work for him; I had the day off :-) ). We set off from the village of Hope Bowdler at about 7pm, and rode up and over Hope bowdler hill, dropping saddles for the steep and loose descent down the other side, then rode down the green lane that runs from Willstone into Church Stretton. From Church Stretton we rode up the Carding Mill Valley track, a testpiece climb that starts off quite relaxing, and gets gradually steeper, looser, and slippier the further up you get. 1000 feet of ascent later, we gasped our way over the last steep section in a steady drizzle, both pleased to have done the whole of the climb without dabbing. Once we’d reached the road, it was getting quite dark, so we stopped to fit lights (a big improvement over last year, when I didn’t have any lights and we ended up finishing the route in semi-darkness). At this point Patrick discovered a substantial amount of play in his headset, probably indicating a busted lower bearing race. However, there was nothing much that we could do about it, so we carried on, with Patrick trying to avoid any un-neccessary front-wheel braking! Tractors are great. They drive at a steady 25–30MPH, and (on account of their less–than–areodynamic design) they pull along a massive slipstream behind them. If one overtakes you whilst you're on a bike, you can usually tuck in behind it without much effort, after which you've basically got a free ride for as long as you and the tractor are going the same way. Writing about web page http://www.gmap-pedometer.com/?r=332222. Saturday’s ride was a fairly un-eventfull jaunt of about 50K around Bakewell, which was very enjoyable, but Sunday was the Big Day Out. We set off from Langsett at about 9:30, and rode up over derwent moor, following the classic Cut Gate path – perfect moorland singletrack in bone-dry conditions. A fast descent off the top over flagstones rolled into a steep and loose drop down to the head of Ladybower reservoir. A few K’s of spinning round the side of the reservoir bought us to the killer climb up to Lockerbrook farm, then a quick descent down to Rowlee farm and the A57. From here we climbed the long, loose ascent to Hope Cross, then blasted down the Roman Road descent, which was almost dry for once, and into Hope. A few more road K’s took us up through Castleton and onto the ‘Broken Road’ – the old Castleton-Chapel Gate road, destroyed by a landslide 30 years ago and now just barely rideable, so long as you avoid the 4-foot drops and holes. More road bought us to the start of Rushup Edge, where my brave attempt to ride the normally-unrideable steep pull onto the edge came to an untimely end due to my camelback hooking on to a tree branch which flexed, then twanged me off the bike. Dignity regained, it was onto the top of the edge for some more top-notch dry moorland riding, joining the old chappelgate road, now a mess of loose rock and gritstone drop-offs. From here, we headed north again through Roych Clough and on up the long pull up Famine Hill. A fast descent down the other side bought us to the oddly-named Peep o’ day, and another big climb onto the top of Chinley Churn. A belting high-speed southwards track bought us into Buxworth and thence Whaley Bridge. A few hundred yards south on the A5004 got us to Taxal, where we dropped off the road and attempted to cross the ford. The score was: 1 rider crossed it dry, one got wet feet, and one went straight over the handlebars to end up sitting in the river. Fortunately it was warm enough not to matter! From Taxal, we followed the trail south along the edge of the Goyt Valley, ending with the long long road climb up to Derbyshire Bridge and the Cat and Fiddle. From here a little gentle persuasion was employed to coax one of the team away from the short-cut road descent back to Macclesfield, and we headed out over the moor again, racing down to the A54. Back off-road again to take in Cumberland Clough, which seems to have got a lot rockier in the last few years, then down to Wildboarclough and the road climb up to the Macclesfield Forest. Though the forest on the wide but slidey gravel track, then down to the reservoir at Langley. Now the end was finally coming in to sight, and we ground our way up the final climb of the day, the long drag up the cobbled track to Teggs nose. We paused here to pre-order a victory curry, then pointed downhill and raced down one final off-road section towards Macclesfield. Just as we came out of this section, with barely more than a mile to go, the puncture fairy made a belated visit, and we were forced into a high-speed tube change, with thoughts of rapidly-cooling Chicken Balti uppermost in our minds. 5 more minutes saw us finally spinning into Rainow, the end of the trip, after 85K of top-quality Dark Peak riding. And whilst I’m not convinced that a 37lb freeride bike is the ideal tool for such an undertaking, I don’t think that I suffered much more on the climbs than Dave on his 22lb Marin Team Ti hardtail, and I’m sure I enjoyed the downhills more!